Sandwiched between Greenpoint and Williamsburg, on what feels like one of those streets that says, “You’ve missed your turn and have surely gone too far,” you’ll find a woman who single-handedly personifies powerhouse, striking, and stylish — while also rocking a smile that’ll save your life. 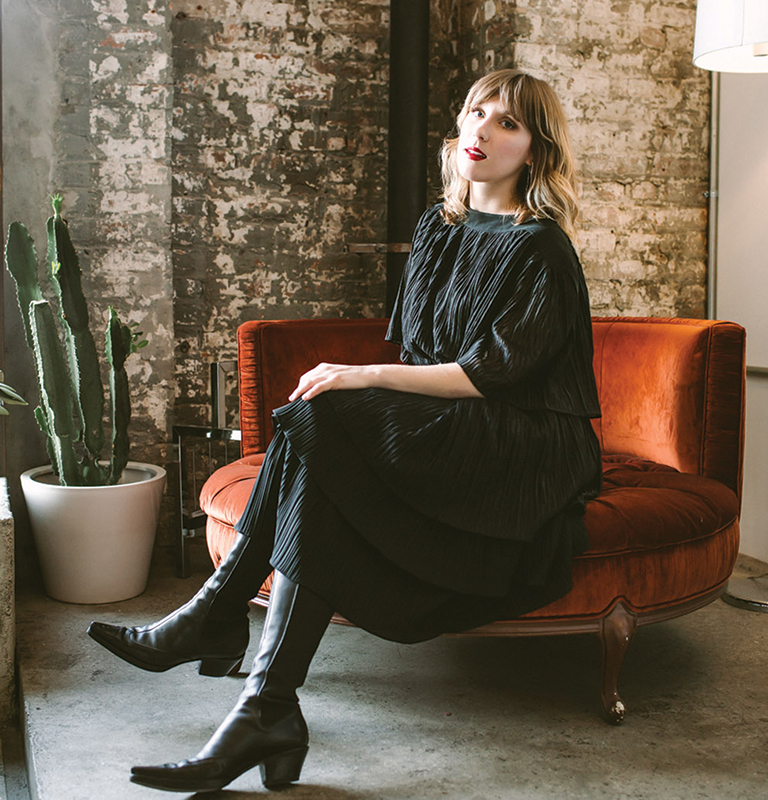 Her name is Hannah Richtman, and she’s the owner of the highly-acclaimed concept vintage store The Break. Inside, you’ll find reworked vintage clothing that’s stunningly modern, thoughtfully curated, and always mindful of the millennial budget. The Break curates and sells vintage pieces that offer elevated nostalgia, but also houses its fair share of cool up-and-coming indie brands such as @Luiny, @glazednyc, and @momformal, which are peppered amongst the second-hand racks. Hannah created The Break with the word community in mind, aiming to build a place where everyone is truly free to be themselves. 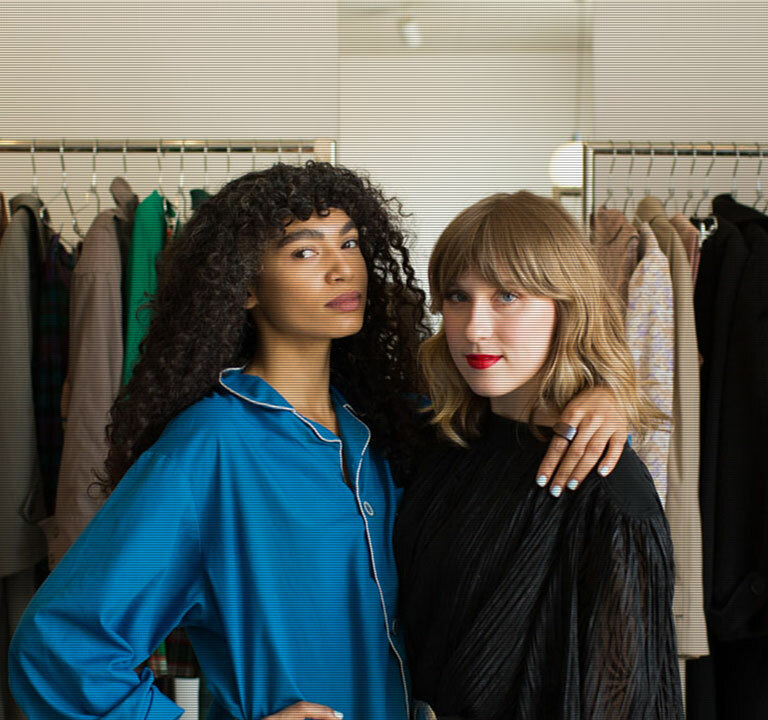 The path to opening a successful vintage store, however, was not a cakewalk. As a young female business owner, she’s faced plenty of struggles and scrutiny. As Hannah admits, opening a store was never really part of her plan. Starting out as a fashion blogger, she quickly gained access to fashion events and shows, but was struck by how cold the fashion world could be. ”The sterility, the who-are-you attitude, and hyper-exclusivity really took me by surprise,” she says. Her hope that there were others who wanted to create an accessible, forward-thinking shopping environment is what ultimately fueled her to take the leap and open The Break. While Hannah is best known as owner of The Break, she also has a very real love for beauty and design. I sat down with her to find out more about her obsession with J-14 Magazine, dewy skin, and Tilda Swinton. When and how did your love for beauty & fashion start? Being that I am from Wisconsin, there wasn’t really a sense of high-fashion. But there were plenty of magazines. Omg, J14…I was OBSESSED. I remember so vividly trying to recreate the makeup looks that I would see in the magazines. I started my makeup obsession at a super young age. I had a full makeup station in elementary school, totally stocked with all of the Bath & Body Works glitter, of course. My mother is a banker, and wore a suit everyday to work, but did an incredible job of letting me be myself. She never challenged my likes or interests. She always let me dress myself, and even let it slide when I proceeded to walk downstairs covered head-to-toe in body glitter! Having a business has absolutely inspired me to find a process that’s pretty easy and leaves me feeling great about myself. That being said, I get bored pretty quickly. The one thing that I’ve discovered that makes changing it up super easy is lip color. I am obsessed with lipsticks. They can completely change and elevate your look. If I’m not wearing one, I almost feel naked. One of my favorite looks on myself is bare skin with a strong lip — such a gorgeous vibe. What are some beauty looks that you’ve tried yourself and weren’t a fan of? I think that there are things that I thought at the time were really working for me, but when I look back on them, I realize…”No, HANNAH! That wasn’t for you.” I remember rocking a super-dark eyebrow with burgundy hair that I would slick back; it was very intense. I remember loving it at the time, but I don’t think i’ll be doing that again. I value experimenting and trying out new things. I have literally had every single hair color under the sun. But what I love so much about beauty and fashion is that they’re sort of ever-changing and always evolving into new and different things. What’s your dream makeup look for yourself? I wish so hard that I could get one of my makeup artist friends to fully beat my face Kim K. style. Like, I wanna be glowing down the street. I don’t have the time or energy to learn how to use all of those different powders and bronzers, but I would just love to see that look on myself. I watch all of the makeup videos on IG while I’m in bed sometimes, and they’re almost relaxing, as well as so full of artistry. Are you a New Years resolution type of person? If so, what’s your resolution for 2018? Yes! Although, I don’t wait for the New Year to make resolutions. I am a very goal-driven person, and I think setting short-term and long-term objectives helps me stay motivated. This year, I’m focusing on efficiency — evaluating what’s working and what isn’t — in my personal life and in my business, and either nurturing it or throwing it out. Owning a business means juggling a trillion things at once, so I’m going to attempt to reduce anything that doesn’t make my life easier or enjoyable! Also, I want to be more like my dog. What’s your go-to night out makeup look? The most fun thing for me is getting ready! I typically rock a light contour, blush, and my signature lip color (whatever I’m feeling at the time). I don’t love a dark eye on myself, so I keep my eyes pretty subtle with a pop of mascara. The most important thing for me when I’m going out is that glowing skin look. What’s your favorite makeup trend right now? DEWY, GLOWING SKIN! Slam that highlighter!